Everlasting Light. Samuel is a retired seaman. He has always been interested in the mysterious sea-mark which is situated on the most Northern part of his country. He has being navigating very often at those places and the sea-mark has actually saved his life. Now, he wants to thank the man who works there, but the man is still anonymous. Unfortunately, Samuel, has never found this human person identity. And as usual, when we miss information about things, mysterous legends come on board. That is to say a mysterious legend has appeared about this sea-mark which says that actually a ghost is commanding it, not a person. This is the story that other salemen are telling. This evening Samuel arrives at the sea-mark and simply wants to find out the truth. When one is dedicated to the work that he or she loves, than that person would do anything to say thank you to other who has done a good thing. People sometimes forget to be thankful and with good manners and choose to have short memory when actually they need no to forget who has helped them. 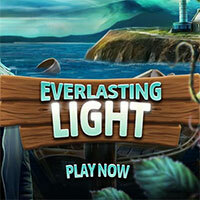 Everlasting Light is a free online hidden object game on Hidden4Fun.